The conclusion given is correct and clearly supported by the interpretation of the data. Key data from the analysis is given and trends in the data are discussed. The extent to which the hypothesis is supported by the data is explained (avoiding “proves”). The level of support (strong, weak, none or inconclusive) for the hypothesis/ conclusion is identified, correct and justified. Students must also provide a brief explanation as to how they came to the conclusion from the results. In other words, sum up the evidence and explain observations, trends or patterns revealed by the data. Scientific explanation for the results is described. Comparison is made with published data and theoretical texts (with citations). The results of the experiment should be explained using accurate and relevant biology. The student should compare the results of their investigation with what would be expected; reference published data or theoretical texts. Compare the conclusions with published research or with the general scientific consensus among biologists about the research question. Do your conclusions conform to the consensus or are they unexpected? 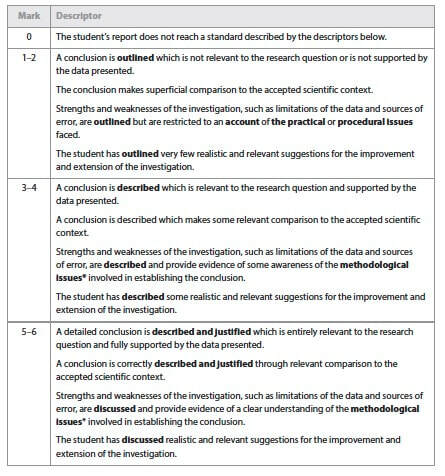 It is not necessary to find an exact same investigation with the exact same results, it is possible to compare findings with another investigation that is different but with results that either confirm or refute those of the student's investigation. The variation in results is reported, showing the strength of the conclusion. The appropriateness of the apparatus in obtaining relevant data is commented on. Weaknesses in the methodology are discussed. The reliability of the data is commented on. The quantity of the data is commented on (both MV and RV). The precision, accuracy and uncertainty in the data is commented on. Outlier data or irregularities in the data are addressed. The design and method of the investigation must be commented upon as well as the quality of the data. Students should consider how large the errors or uncertainties are in the results. How confident are they in the results? Are they fairly conclusive, or are other interpretations/results possible? Identify and discuss significant errors and limitations that could have affected the outcome of the experiment. See the pages on statistics and graphing for help in determining significance. Were there important variables that were not controlled? Were there flaws in the procedure which could affect the results? Are measurements and observations reliable? Was there a lack of replication? Emphasis in this section should be on systematic errors, not the random errors that always occur in reading instruments and taking measurements. Identify the source of error and if possible, tie it to how it likely affected the results. Students must not only list the weaknesses but must also appreciate how significant the weaknesses are. Comments about the precision and accuracy of the measurements are relevant here. When evaluating the procedure used, the specifically look at the processes, use of equipment and management of time. ​​Where limitations are determined to be significant, specific improvements are proposed. Improvements effectively and specifically address the limitations. Improvements are given which are possible within the context of a school laboratory. An addition research question is stated with clear MV and RV. The research questions are an extension from the conclusion and evaluation. A short explanation for the question is given to establish its importance and relevance. ​Suggestions for improvements should be based on the weaknesses and limitations identified. Modifications to the experimental techniques and the data range can be addressed here. The modifications proposed should be realistic and clearly specified. Suggestions should focus on specific pieces of equipment or techniques used. It is not sufficient to state generally that more precise equipment should be used. Vague comments such as “I should have worked more carefully” are not acceptable.